Got a little more to spend? See our gift ideas of under £25, under £50 and, if you are feeling even more spendy, gifts up to £100. Buying for a home lover when you are on a budget can be a challenge. But we promise your friend with the intimidatingly impeccable taste won’t be disappointed by this Anthropologie mug. Who knows, maybe they will even give it a spot on their insanely organised kitchen shelving? Tiled Margot Monogram Mug, £8, Anthropologie. 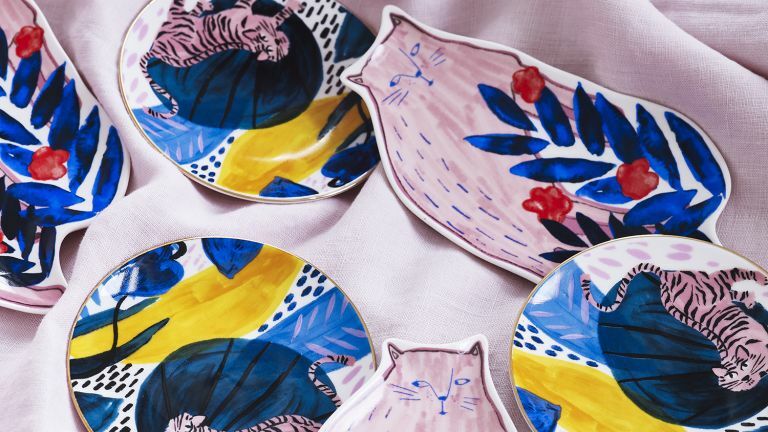 Find more gifts for home lovers in our buying guide. If you’re buying for a foodie, it can be tempting to go for just a standard box of seashell chocolates or various bottles of stupidly small spirits. But be more original this year and go for this spaghetti measurer, because has anyone in the history of spag bol ever managed to cook the perfect portion of pasta? 'I could eat a horse' spaghetti measure, £9.95, Amazon. Find more great foodie gifts in our Christmas guide. As self-confessed gallery wall addicts, we are fully aware of how expensive prints can get, but this retro San Francisco print comes in at under a tenner and it’s huge! Stick it in an Ikea frame and you’ve got a really thoughtful gift for the travel lover in your life. San Francisco print, £7.50, Oh Deer. Shop for more genius travellers' gifts in our Christmas buyer's guide. Cute, tiny illustrated cacti printed on a very handy desk organiser for way under £10. Need we say more? Cacti deskpad, £7.95, Ohh Deer. Because who actually wants another gingerbread scented shower gel? Treat them to a luxurious fresh face mask instead. Lush has a huge selection for all different skin types and each is packed full of fresh, organic, natural ingredients. Our personal favourite? Rosy Cheeks. Not just because it’s a beautiful hue of millennial pink but it's filled with a blend of kalin, calamine and Turkish rose oil that calm the skin and help restore balance. Rosy Cheeks, £8.50, Lush. Don't miss more gorgeous beauty gifts in our Christmas shopping guide. We are a sucker for anything personalised, and this Christmas Marmite are again offering to stamp anyone’s name on the jar of their yeasty elixir. Love it, hate it or just sort of indifferent – it really doesn’t matter, it looks cute on the shelf near to the toaster and lasts forever. The personalised jar, £5.49, Marmite. Teens are notoriously tricky to buy for, but we promise, get them something that tricks out a smartphone and you are golden. PopSockets (basically just a contraption that makes holding your phone easier) come in loads of different colours and patterns so we are sure you will find something to suit your selfie loving teen. PopSocket, £9.99, Amazon. Shop for more teen-pleasing Christmas gifts in our buyer's guide. Perfect for your eco warrior friend who wants to feel they are sipping cocktails in a tiki bar rather than in the makeshift pergola in their back garden, these bamboo straws are reusable and 100 per cent natural. Brewdog Bullet, £8, Beer Hawk. Er, more gifts for him... or indeed presents for her? This way please. For the budding adventurer, here’s the perfect travel inspired coaster. We can’t get enough of Nina Cosford’s quirky illustrations and this Scandi style design is possibly one of our favourites. Wonder if they do this print in a wallpaper..? Alpine Icons coaster, £2.95, Ohh Deer. And to go with said coaster, treat the coffee snob (sorry we meant aficionado) in your life to a lightweight, easy-to-use milk frother, perfect for making those office coffees a little more fancy. Kitchen Craft milk frother, £4.99, Amazon. The perfect place to toss keys or keep jewellery, Kimi the Cat is not only cute, but practical too and we think she/he/it would make a lovely quirky addition to any dressing table. Kimi the Cat trinket dish, £9.50, Oliver Bonas. Show your secret Santa some appreciation with this tote bag from Oliver Bonas. Maybe you could get one too? You could match. OMG. BFF. We know we would say this but Real Homes magazine is a fab read – as well as being a great reference for anyone looking to transform their home. It brings you all the latest on updating your home, be it owned or rented, and whether your giftee is on a budget or splashing out on a forever family home. It covers the latest decorating trends, too. So give the gift of inspiration, all for well under a tenner. The latest issue is in the shops now or you can buy any back issue online. Sure, salt and pepper shakers are a bit of a boring gift, but flamingo salt and pepper shakers, well that's a whole different story! These cuties from Sass and Belle are sure to brighten up any kitchen table. Make the millennial in your life smile with this quirky Christmas dec. It says 'sure you will never be able to afford a house but at least you have this unnervingly realistic brunch food to hang on your tree'. A tea towel? Really? Yes really. Because this is actually a super cute tea towel that would be a great gift for anyone on your Christmas list! Top tip: Tea towels also make lovely framed prints, so you could always grab yourself a basic frame from Ikea and transform a budget tea towel into a snazzy piece of artwork. Bitter... but organised! These cynical notebooks would be a great gift for your work colleague, offering them the perfect opportunity to express some subtle passive aggressive angst in the office. And this delicious little box of Hotel Chocolat chocolates has a bit of everything in it, so if you aren't sure of their tastes this is a safe option.